A 90 day supply of insulin arrived from the mail order pharmacy today. It came in a styrofoam box with two (mostly melted) ice packs. It’s all in a refrigerator now, 10 injection pens each of two different formulations. The insulin came with an itemized bill. I pay nothing. 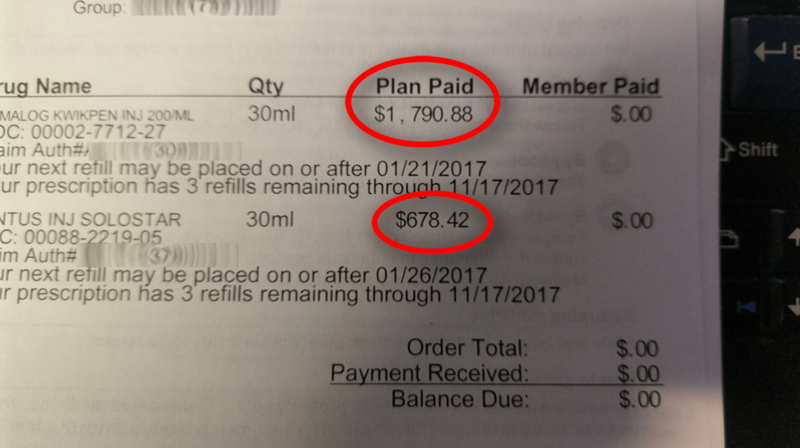 My insurance plan paid $2,469.30 — or so it says. You never really know. Does anyone actually pay $2,469 for insulin? Who can afford over $800 a month, plus the consumables involved for testing and injecting? Why is insulin so expensive anyway? Isn’t this a mature product with versions beyond patent protection? I am very lucky to have Medicare and a supplemental plan which covers me nearly 100%. I wish we had this for everyone. I have no experience with insulin but when my mother was sick some of the chemo treatments were $30,000.00…with a single bag of an infusion being $17-23,000. So said the itemized bills from insurance. I think the high price might be because of the injection pens, not the insulin. The same as the epipens. I’m not saying that this is right, just that this is how they try to justify the cost. I have been taking daily insulin for 53 years. I have always had medical insurance coverage. I can’t let myself be without medical insurance; usually through work but now through Medicare and a Medicare Advantage HMO. I currently pay nothing for my insulin because it is infused through a pump. I am very worried about Paul Ryan’s plan to gut Medicare and what it will mean for the millions of individuals on Medicare. There has been a tremendous increase in the cost of insulin over the last 10 years. No one is explaining this except that big pharma can get away with it. Insulin is a life sustaining drug. The current prices are deplorable. So Geoff at 74 I still work because I am so fearful of the donut hole with Medicare. Add the cost of Creon to the insulin products and most people would have nothing left to live on. Big pharma is raking in the money at the expense of so many who have no alternative options. I am part of an ongoing Medicare project. When I was first asked if I ever had to choose between food and meds, it gave me pause. For those of us who survive pancreatic cancer only to face more obstacles – life challenges become daunting.